Orlando 5-days/4-nights plus 2 Disney Touch Of Magic Tickets View Details When it comes to Disney vacations, this one is tough to beat! Save more than 50% off this 5-day/4-night Orlando getaway complete with luxury accommodations at Westgate Resort, located just one mile from the main entrance to Disney! Plus receive to Disney Touch of Magic tickets valid for 3 days of Disney fun, including two days at your choice of Disney’s major theme parks, plus an additional day at one of Disney’s refreshing water parks or DisneyQuest. More free info now from Edward E. Cambas at www.edwardcambas.com. 20 years of travel experience. View Details from the desk of Edward E. Cambas. Save up to 55% off an amazing Disney World resort vacation package. Experience 4 days and 3 nights of luxury at Westgate Resort, located just minutes from the main entrance to Disney! Plus receive to Disney Touch of Magic tickets valid for 3 days of Disney fun, including two days at your choice of Disney’s major theme parks, plus an additional day at one of Disney’s refreshing water parks or DisneyQuest. Description: Royal Resorts is a leader in the Mexico resort industry. Located in Cancun and Playa del Carmen, all the Royal Resorts are beachfront properties offering accommodation in spacious and fully equipped two-bedroom units, and five-star amenities ranging from pools, tennis courts, water sports, an activity program for children and adults, and a spa and gym to restaurants, bars, convenience stores, travel and car rental desks. Operated as private clubs with 24-hour security and daily maid service, they are the perfect family getaway! From the desk of Edward E. Cambas, VP of sales and marketing. With songs like “Teenage Dreams” and “I Kissed a Girl,” Katy Perry catapulted onto the world stage where she continues to wow fans with her effervescent, outgoing personality and whimsical, irresistible pop songs. Now you can catch Katy Perry’s electrifying concert as part of an incredible weekend event getaway in beautiful and sunny central Florida! It’s a special, limited availability package that is sure to sell out quickly. Book your package today! This amazing concert getaway package features two tickets to Katy Perry at the St. Pete Times Forum in Tampa with seating in a comfortable luxury suite! But your package also includes transportation to and from the show, personal concierge services, a VIP Welcome Party, and a three-night stay in a spacious two-bedroom villa at the luxurious Westgate Lakes Resort & Spa. Ideally located just minutes from Universal Orlando, SeaWorld Orlando and Walt Disney World Resort, Westgate Lakes is a lush tropical paradise that boasts a scenic lakefront setting, luxuriously appointed villas, a world class, full-service health spa, the Smokehouse Grill restaurant, eight swimming pools and a full schedule of family activities. Luxury accommodations, Katy Perry in concert, and much more – this exceptional event vacation package is available to Westgate owners for just $399 per couple! You can also share the fun. We will extend this special price to any of your family and friends who might want to attend. This lakefront resort is a lush tropical paradise just minutes from Disney, Universal and SeaWorld. Enjoy a luxurious vacation experience, from lavishly appointed villas to a world class spa plus multiple pools, water sports, basketball, tennis, volleyball, fishing and a kid’s club. From the desk of Edward E. Cambas, President of Worldview International. Our stay at the Westgate Hotel on March 2008 was excellent. When had two problems with room when arrived, the refrigerator was not cooling and their was a metal part of the middle of one bed sticking out but they immediately came and fixed. Everything else was super and I loved the view and the pools and the beach front and downtown and rest. and activities were in walking distanced if we wanted to walk. The staff was so pleasant and helpful and made us feel we were so important.Having a safe in the room was very nice. Beds were comfortable.The pools were heated and a joy to swim in even though it was cool. The Kingdom across the street was not open which it was spring break and felt it should have been and no one told us that when we booked with Expedia.com nor are there any smoking rooms but you can smoke on balcony and most everywhere else in town. Going to Hard Rock cafe is a must Riply’s Aquarium. From the desk of Edward E. Cambas, a Lic. Real Estate Broker (inactive). 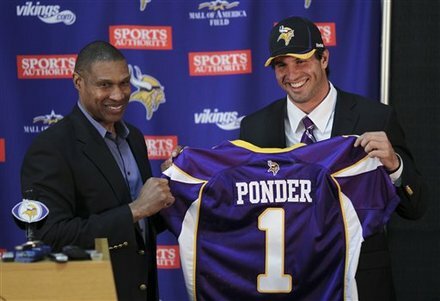 Minnesota Vikings first-round draft pick Christian Ponder(notes), right, holds up a jersye with head coach Leslie Frazier during an NFL football news conference Friday, April 29, 2011 in Eden Prairie, Minn. The good news is nobody fails. But only three teams go to the head of Pete Prisco's class with A's. The Texans, Giants and Bucs did their homework, while the Chiefs and the Seahawks obviously didn't -- according to this NFL Draft final exam. From the desk of Edward E. Cambas we would like to share some important things with our family Disney travelers. Spring has sprung at the Walt Disney World Resort as the 18th Annual Epcot International Flower & Garden Festival is officially in full bloom. Now through May 15, Park Guests can gawk at newborn butterflies, gardens with a global flair, and some of their favorite characters-turned-topiaries. Making it even more spectacular, this is the first time the festival is featuring Disney·Pixar Character topiaries. The Insider spoke with Horticulture Manager Eric Darden and Topiary Specialist Renee Worrell about bringing these plants of fantastical proportions to life. "There are many must-see attractions, and they're all special for different reasons. But this time we have Pixar topiaries – we've wanted to include them for years. Woody and Buzz are right up at the front of the Park ... it's really exciting!" Eric says. In addition to Woody and Buzz, there are more than 75 Disney Character topiaries throughout the entire Festival (over 100 in all! ), including Luxo Ball, Lightning McQueen, Tow Mater, and Lots-O-Huggin' Bear. Renee feels nothing but affection for Lotso. "He's supposed to be mean, but he's full of begonias and just cute as can be." 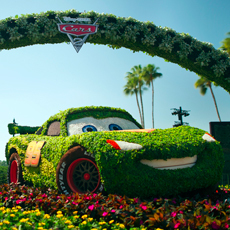 Cuteness aside, lots 'o' creativity goes into developing the topiaries each year. Renee describes collaborating with the Pixar team. "With most of our character topiaries, we create maquettes based on conceptual drawings. Then we select the plant material before working with welders who build the frames – there needs to be enough room for the root balls and plant material to grow. But Pixar sent us clay sculptures for each of their character topiaries ... we used them to make molds for the frames." Frames are then hot-galvanized to prevent rust and painted like a car. Once complete, they're sent to the greenhouse for irrigation and then on to Renee's team for stuffing and planting. A character artist ensures that the topiaries remain true to each character's personality. Adjustments are made by adding or subtracting moss rather than by altering the steel frame. Ficus Pumila, commonly known as "Creeping Fig," is one of the best plants for topiaries. Renee explains, "It's just green, and works well for arms and everything. Alternathera's great because of its brilliant color." Some other plant materials used include fast-growing Lysimachia (AKA Creeping Jenny), Stipa Grass (known as Mexican Feather Grass), and Woodyetiya, a palm tree seed used mostly for the characters' eyes – unless hungry visitors decide otherwise. "A squirrel crawled right up and ripped the [seed] eyes out of Beast one year!" The topiaries remain in the greenhouse until they've slowly adapted to the sun – otherwise, Renee says, they'd burn from full exposure. "Doing the Festival earlier in the season means we don't have so much of an acclimation period to deal with. Plus, the color's just incredible this time of year." Growth, depending on the size of the topiary, takes approximately 8 to 12 weeks. Ficus grows approximately one inch in a month and a half. Some of the Park's largest topiaries measure 12 feet wide and 8 feet tall, so moving the fully grown topiaries to Epcot is quite a production, according to Renee. "We just roll them up onto open-topped trucks with an electric pallet jack. Some pieces are really big, like the arch where Lightning McQueen and Tow Mater are. It's actually two pieces – it took a low-boy semi [truck] and two cranes to transport and assemble." Daily care includes watering, fertilization, trimming, pinning, and any necessary touch-ups. "Even though there's an internal irrigation system, our crew still needs to check them individually because certain areas (like arms) dry out faster. Each topiary must look as good as the day it arrived ... Guests might only have one chance to see them. That's what we strive for." Renee and her team have back-up plants in the event something gets damaged. After the festival, topiaries return to the greenhouse to be cleaned and stored for the following year if they don't replace others throughout the Park. Does Renee have a particular favorite? "I haven't really decided which character's my favorite ... each brings back memories. Trying to deal with Woody's skinny arms was really tough because he's a ragdoll. To remain true to his shape, we used a lighting truss where Woody's elbows are flat to get the irrigation plugged in." In addition to the topiary extravaganza, there's a lot more at the festival for green thumbs and nature aficionados to enjoy. Bambi's Butterfly House presented by HGTV is three times larger this year – one little-known fact is that the butterflies are released from their chrysalises so Guests can watch them emerge up close. "It's one of my favorites," adds Eric, "because of the children's reaction. Seeing butterflies come to life, spread their wings, and fly off is a pretty phenomenal thing to observe." Don't miss the debut of Disney·Pixar topiaries at the Epcot International Flower & Garden Festival this spring ... Woody and the gang are waiting! Order a Galaxy now from the desk of Edward E. Cambas. Have you seen the Sidekick from T-Mobile? From the desk of Edward Cambas. Get more free info. From the desk of Edward E. Cambas in reference to godaddy.com. We are a proud marketing affilliate with Go Daddy. Click the link to find out more. My name is Edward Cambas, President of Worldview International. I hope that you find everything you are looking for. If you need something, please contact us. Thank You. We have all of your airline tickets at the lowest price and our system is always easy to use. Edward E. Cambas is the president of Worldview International. Have you ever tried booking buddy? This is a great site to save a lot of money. From the desk of Edward Cambas. Immediate Confirmations , easy and safe to book your airfare. From the desk of Edward Cambas. Fast Confirmations easy to use. From the desk of Edward E. Cambas. From the desk of Edward Cambas. We have the lowest pricing on airfare, cruises, and vacation packages. Welcome to Worldview International. Thank You for choosing our website. We have the best prices for specific travel destinations all around the world. Need an inexpensive get-away? We have more info coming soon.